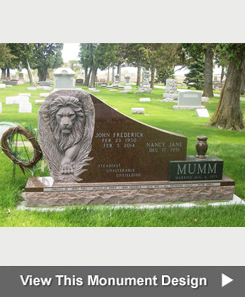 Read testimonials from customers of Iowa Memorial Granite Company to learn how satisfied families are with work of the monument, gravestone, headstone and grave marker designers. "Polly, Thank you for doing such wonderful work to honor my grandmother. I really appreciate how helpful you and your husband have been. Thank you!" "Our family was out to the cemetery this morning and saw Lincoln's monument for the first time. It is beautiful and perfect! Definitely a bittersweet moment to finally see something in that spot. Thanks again so very much for helping us to plan, design, and purchase such a special stone for our son. It means so much!" "Tara & Polly: Thank you for all your help with the headstone. Sorry I’m so indecisive. You came up with a beautiful face with the large cross and grapevine." "Friendly, helpful, compassionate service. Very resourceful, couldn't be happier. Thank you so much!" "Polly - Very happy with your help and follow thru." "The monument was finished on schedule. 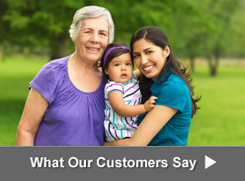 We were pleased with your service." "Thank you for your patient helpfulness in all the details. We think the memorial looks great!" "Polly, thank you for all the work that you did to get everything done and just right for the monument. The pictures are excellent and everything looks great. Sad for us that we had to have it at this time but it is wonderful how it turned out. Thank you so much." "Excellent service. We are so fortunate to have outstanding people working here is Muscatine." "The memorial for R. Beard looked very nice. Thank you for your cooperation in doing business with me so far away." "Everything was handled so professionally. Losing a grandson was the event pushing us to complete this necessary project. The gentleman who set the memorial was GREAT!" 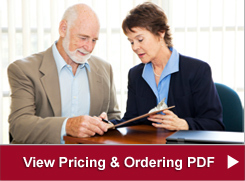 "You did a great job on the printing and I received great service." "Referral was highly recommended. Very helpful in making decisions. Cost for all aspects of a funeral are overwhelming. Your smiles helped." "Professional, personal service and high quality product. Outstanding response from owner and employee. Will recommend to others." "Friendly - practical prices - fast delivery. Could not be happier. Thank you." "Randy and Polly are wonderful to deal with. I really like the stone." "The family was very pleased with the outcome of our parent's headstone. Couldn't have turned out better! Polly and Bonnie were very helpful in the whole process." "The service - excellent. The workmanship - excellent. The finished product - excellent. The friendliness and professionalism - excellent." "Excellent. Very helpful in deciding design. All done with very careful and precise workmanship." "Beautiful monument to my mother. Very sensitive and caring person when I was picking it out. Very pleased with your service." "From order date to delivery, very good service." "Very patient with me - turned out terrific." "The stone is a beautiful piece. Thank you for your patience and thoughtfulness. I had no idea there would be so much to decide and you were so helpful. I will pass your good name on to others." "Tom, thank you so much for the photos. I am so pleased with my gravestone - it is just as I imagined. Also, the repair on my parents' stone looks great. 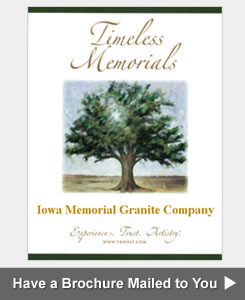 I will certainly be referring my sister, cousin and other friends and family to Iowa Memorial Granite Company. The company's services have been professional and of the highest quality." "Polly was very helpful and compassionate. Thank you." "We enjoyed the experience at a difficult time in our lives. Very professional, but down to earth people." "Very satisfied - a job well done!" "Absolutely fantastic. Customer oriented and customer friendly." "Great to work long distance with you." "The monument was done just like we requested and set on schedule. We appreciate the service." "Mary did a wonderful job designing and engraving our stone. We are very pleased." "Done very professionally and tremendous compassion was shown during our most difficult time. Thank You." "The engraving is beautiful and Polly & Randy did everything we asked." "The headstone was finished sooner than I expected. It was exactly what was ordered. Thank You "
"Polly, is an excellent sales person and your company did an excellent job in trying to match the monument with the existing one." "Beautiful,Great workmanship,Friendly people and very helpful. " "Monument has met our wildest expectations!!! Couldn't be better." "I was very satisfied with the service. Very friendly, patient and compassionate." "Polly was great to work with and was set up by date promised." "Ordered two stones at the same time. Both are perfect! Thank You"
"Very helpful & great to work with. Thanks"
"Thank you for the considerable help to make this happen during the flooding." "It looks beautiful. Thank you." "Thank you! It looks very nice, also, thanks for fixing Marlyn's little sister's stone. We really appreciate it. It looks very nice. I appreciate all your advice and help." "Beautiful! I really like Bob's headstone. It is hard to imagine the work to create the whole design. Thanks!" "Very pleased with the stone, setting and fixing of the other foundation. It is all we wanted. Great Job! The Trout family thanks you very much." "Service was excellent. The stone was placed earlier than we expected it to be completed." "The monument is lovely. Thank you to all." "You delivered when you said you would. Thank you. The stone for our baby girl looks beautiful. Great job." "Especially considering the circumstances, we were pampered. We were shown the utmost in caring, professionalism & courtesy. What a great staff you have to deal with." "To everyone who has contributed to my husband's memorial, it is beyond all my expectations and brings great comfort and a feeling of calm when I visit the cemetery. I thought I would feel sad when I saw it the first time, but instead it made me smile. Mel and the dogs often sat outside to greet me when I came home from work. And now it is literally cast in stone. Thank you again for all your hard work and the care you give to those of us who come to you." "Thank you for the great job done on our stones. We are very pleased with the way they look"
"I wanted to let you know we are very pleased with our markers and tell Randy we feel he did a good job installing them. We watched each step as they were put in. We also felt comfortable with you when we ordered it and appreciate you notifying us of the American Hero border which we like so much better than the standard border. Thanks again." "Thank you for all of your help and being so patient with us. Katie is so proud that she picked out the design of Mim's stone, and it makes Jacob and me so proud of her." "The stone is lovely. You had so many helpful suggestions. I do appreciate all you did to help me through this difficult time." "Randy & Polly, thank you from the bottom of my heart for repairing my husband's headstone after the storm. As always, you did a fabulous job. Thank you, again." "I just want you to know how pleased the family members, who live in Seattle, WA, were when they saw the stone. The white printing of the scripture verse was very striking! You did a beautiful job on the stone! Thank you!" "Everything looks very nice and the service was great"
"Thanks so much for letting me know the engraving is finished on mother's stone. And thank you, for helping to make our short visit home so easy. Everyone helped make Mom's return home a happy event rather than a sad one." "Thank you for your Good and Timely service. The etching was very good, as was the stone. Thank you Polly for your attention to our needs." "Service was great and the monument is perfect." "Thank you for putting up with all my changes and all my tears. It takes a special person to do your job. It is just perfect. I am so happy you helped me personalize it. It is so Meghan, I just didn't want to leave. That was exactly how I felt. The lettering and color is perfect and the special icons at the bottom are unbelievable. Thank you, Polly for all you did." "Everyone is absolutely satisfied. It is a great tribute and I enjoyed working with you and Randy on this and the Reagan memorial. Thanks." "The family certainly appreciated everything you've all done from start to finish. The memorial stone looks wonderful. Thank you." "WOW! A most beautiful job. Thanks a million." "You did a fine joy and we are very grateful. It's a beautiful stone. Thank you!" "Our entire family loves the stone. Thank you so much! Everyone loves the personal touch and we've had positive comments from others in the community, too." "You did a great job, thank you very much"
"We were very satisfied. We liked how the stone turned out." "The stone was all I had hoped for and my family were all pleased with it, also." "We love the stone and the way it sits in the cemetery. Thanks so much." "Your service was wonderful. So very prompt and so very helpful. Thank you so much!" "Dear Polly, Randall & Staff: Thank you so much for all your help and great ideas in designing Richard and my headstone. I truly couldn't have done it alone. My family & I absolutely love it! The monument is beautiful and is just "so us"! Thank you again." "We are pleased with the workmanship and timeliness for the lovely memorial stone in memory of our beloved son, Gordon. Thank you." "My parents monument came out beautiful. And Polly was wonderful to work with. She made the process very simple, especially from across the country here in Massachusetts. Between the website and the mock drawings, I didn't have to be there, which was important. We've had many nice compliments and people really love it. Thank you to everyone there." "It was a pleasure and a priviledge to work with you, Polly, and I appreciate your promptness and all of your help and advise. Thank you again for all your help"
"You were great to work with!" "Everyone was very kind and helpful to me and my family." "Polly in Muscatine, IA did an excellent job. Looks great in the cemetery." "Satisfied with very good service. Marker looked beautiful." "Polly was amazing. She knew exactly what I wanted and helped me find something that symbolizes my daughter so well. She even cried with me. Thank you for an amazing job." "I want to thank you for working along with me because of my small payments and also for lowering the total price. I am very satisfied with the headstone." "Great service and a special experience dealing with Polly at a sad time. I appreciate the way it was handled." "We appreciate all the kindness and the wonderful, friendly job everyone did." "I really like my headstone. Done really fast too. It's awesome." "To everyone from Iowa Memorial: Thank you for all the help in making the one of a kind Memorial. A special Thank's to Polly for all the help in making the design. I'm very happy!" "Everyone was very pleased. It was much nicer than we thought it would be. Thank you." "You were very kind & helpful"
"We could never thank you enough for how fabulous Royce's stone turned out! You were wonderful to work with and we truly appreciate everything! We have received so many compliments and a ton of people have stopped just to see it. Thank you so much!" "Very satisfied with the way it turned out!" "Allison's stone looks beautiful! We enjoy visiting her now and putting flowers there for her. Thank you for all your hard work. We appreciate everything." "Thank you so very much in placing Mom's marker in time for the memorial service. It is wonderful. You did an expert job for us and we appreciate it!!" "The marker looks wonderful and Polly was more than helpful to work with! Thanks!" "We are completely satisfied with your work and your service. Our monument is exactly what we wanted and beautifully done! Thank you!" "Very nice work & very nice staff to work with on the design." "Very good and efficient. Very professional"
"My kids and I were very pleased with Mark's monument & like the lettering & color very much. It was a job well done & thanks so much for your work & service"
"Iowa Memorial Granite in Muscatine, IA has been wonderful to deal with. They have gone the extra mile to make the memorial for my mother match the others in the plot." "We appreciated Tom's personal care & taking the time to personally view the existing stone to match our addition. Thank you!" "Given I have never met you folks, the photo indicates a well done memorial. Thank you." "Your service was wonderful. The memorial was correct on everything & placed so nice. Thank you so much"
"The monument looks very nice. Thanks for making all the adjustments I called to add & change. Also, thank you for all the care & compassion you showed at this very difficult time." "Polly was very helpful with suggestions. I was very appreciative of Randy's timely placements of the stone & vases." "Very happy with the monument and the service. Thanks." "Polly - you did a great job. Thanks so much!" "Great product and service as was advertised. I would highly recommend Iowa Memorial to anyone. Thanks!"